Ever since Taylor Moton switched back to right tackle in Week 2, he’s put in strong performances, especially in pass protection. That continued against a Giants’ pass-rush that simply doesn’t have the edge presence that should trouble quality NFL tackles. Moton is proving to be just that and he kept the New York pass-rush away from quarterback Cam Newton on the right side of the pocket throughout the game. The Panthers spread the load in the passing game and got quality contributions from their shifty receivers in particular. Rookie D.J. Moore showed his qualities after the catch both on runs & passes, Christian McCaffrey took advantage of a breakdown in the New York secondary for his receiving touchdown and Curtis Samuel broke multiple tackles on his first two receptions of the season. Without a clear “number one” threat in the receiving corps, these contributions throughout the team will be crucial all season. The Panthers’ defensive tackle rotation was, for the most part, dominant up front in limiting running space for Saquon Barkley. Carolina ran four deep, receiving quality contributions from Dontari Poe, Kawann Short, Vernon Butler and Kyle Love. They may not have lit up the box score, but they suffocated the Giants’ ground attack to set up plays for their teammates. Julius Peppers was one of the beneficiaries of the dominance of the Panthers’ interior defenders, but he still showed he can make plays for himself, shutting down Barkley on one attempt to bounce outside. In spite of Barkley’s best attempts to get loose, Peppers kept hold for the tackle for loss and simply kept running Barkley back. This was comfortably Peppers’ best performance during his 17th NFL season, as he picked up multiple pressures and multiple stops to show for it. Barkley’s game-to-game production continues to be consistent even if his play-to-play production remains erratic. Another game with more than 100 yards from scrimmage was sparked by big plays rather than down-to-down consistency, but while the big plays last, Giants fans will be happy. 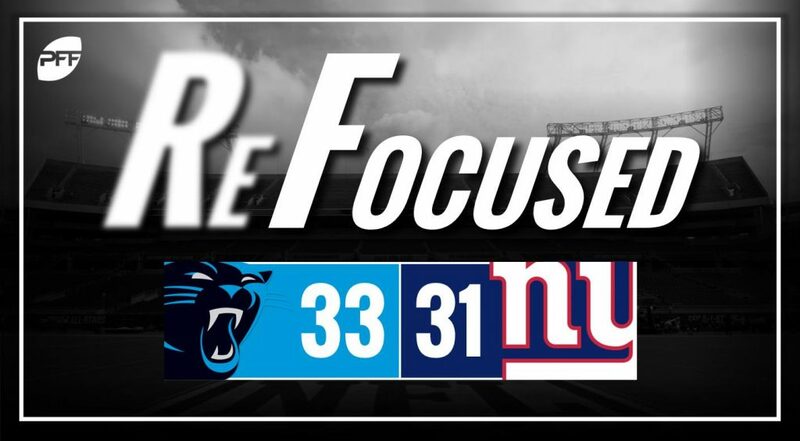 He had a couple of chunk plays on the ground paired with big plays through the air off a trick play from Odell Beckham Jr. and the late go-ahead score exploiting a peel blitz by the Panthers that was ultimately for nothing thanks to Graham Gano’s heroics. A passing touchdown and finally a receiving touchdown for the first time in a year were the highlights of a big game from Beckham. Unlike Barkley, the big plays weren’t the majority of Beckham’s performance. He racked up eight catches and comfortably got the better of his matchup against James Bradberry. Another game, another productive one for Damon Harrison. Snacks racked up the stops, occupying the Panthers’ interior and doing more than his share of shedding blocks to make plays and limit the Panthers’ gains through the middle. Harrison clogging the middle and picking up a handful of stops is one of the most reliable occurrences week-to-week in the NFL. It was a wild game from Landon Collins, as he made multiple stops and a pass defense (nullified by an unnecessary roughness call). However, he also had multiple missed tackles and played his part on McCaffrey’s touchdown reception on a miscommunication. Collins has had a hit-and-miss start to the season, and it was a hit that was his biggest impact in the game, hurdling a cut block by McCaffrey to hit Newton as he released the pass, exacerbating a miscommunication to setup Janoris Jenkins‘ interception. Simply put, it was Graham Gano‘s right leg that played the key role in Carolina’s win. When it seemed the Panthers had managed the clock poorly on their final drive, Gano stepped up to send the Panthers to 3-1 and a tie for the lead in the NFC South. Miscommunication on the defensive side of the ball and an inconsistent offense ultiamtely cost the Giants the game.